It is a severe condition due to meningococcal sepsis, it occurs in 15 to 25% of those patients with meningococcemia. To prevent this complication of meningococcemia you have to be prompt and agressive with IV antibiotics and support of vascular perfusion. The use of Xigris (drotrecogin alfa activated) have shown promising results once the process has instaled. Often this patients require surgical debridement, skin grafting or limb amputation. 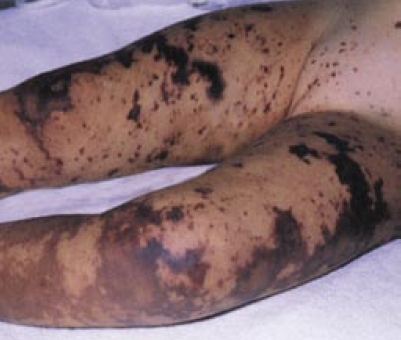 WHAT OTHER CAUSES ARE THERE OF PURPURA FULMINANS? (OTHER THAN MENINGOCCEMIA?) WOULD LOVE A REPLY… WORK AS A CRITICAL CARE RN AT A BURN CENTER IN ST. PAUL… THANKS!